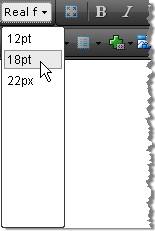 The Real Font Sizes dropdown displays a predefined set of font sizes in pixels and points. The dropdown is populated from the RealFontSizes Collection. You can add to the RealFontSizes collection declaratively, programmatically and using the ToolsFile. Use the RealFontSizes collection Add() method to include new items in the list.